In 2004, cartoonist Dan Clowes released the 23rd and (so far) final issue of his groundbreaking alt-comics series Eightball. The oversized Eightball No. 23 contained only one story: “The Death-Ray,” a dissection of superhero myths and patriotic fervor that, at the time, The A.V. Club dubbed “another story for the comics canon” and which we later included in our list of “The Best 25 Comics Of The ’00s.” This month, Drawn & Quarterly is re-releasing “The Death-Ray” in a hard-bound edition, and Clowes spoke with The A.V. Club about his mindset when he was working on the book a decade ago, how his approach differed on his more recent books Wilson and Mister Wonderful, and what the creator of Ghost World has planned for the near future, both in comics and as a screenwriter. The A.V. Club: People often ask musicians if they listen to their old albums or filmmakers if they watch their old movies, but do you reread your old comics? Dan Clowes: I try not to. [Laughs.] It usually doesn’t lead to anything good. The only way I can ever experience them really is if I completely forgot what they were about. Once I send it off to the printer, I try to never look at the work again, if I can help it. Usually when I put together a book like this Death-Ray hardcover or that Ghost World special edition, then I have to reread it and see if there is anything I want to change or any re-coloring I want to do. That’s when I’m faced with the actual work. When I’m working, I’m too close to it. I’m sort of inside, and I can’t see it at all. So when I have that experience of rereading it years later, it’s jarring. AVC: Have you always been that way? It would seem that as a younger artist you might have that “Look what I made!” impulse. DC: No, I never had that. Everything I ever did I felt like I could see the mistakes and I could see what I needed to do but failed to do. I think I have a very clear vision of what I want things to look like, and there’s this huge gulf between that and what they actually look like. [Laughs.] I mean, I also think that gulf is what makes the work interesting, but as a creator it’s endlessly frustrating because I’m starting out with this goal, this thing I’m trying to create, and then the thing I actually do create is very, very different. It’s always painful, in some ways, especially when it’s just finished. I’m always hiding the books in my closet, and my art’s always turned upside down in my drawer. AVC: So on the rare occasions when you go back, like with The Death-Ray or the Ghost World book, are you able to experience it with any objectivity? Does it take you back to the moment of creation at all? DC: This is true of almost everything I’ve ever done: As soon as I’m finished with it, it feels like an impersonal project. Like, “Well, I did another book.” I had this goal in mind and I achieved it, and hopefully it was entertaining for some reasons. I never think of it as anything that is that personally connected to me. But when I go back and reread the stuff, I’m always floored by how deeply personal and revealing it actually is. There are certain things in there that no one else would recognize, really. I see details of my life that I didn’t even intend to put in when I was doing the work. For example, I noticed that every single kid in the high school in The Death-Ray is based on somebody I went to high school with. But I wasn’t thinking of these specific people when I was drawing the comic. I just would draw a kid and I’d think, “Well, he has to resemble Bruce Wilkerson from 12th grade,” because that’s the type of kid he would be. These kids who had entered my unconscious and lived there forever are now coming out into the work. It didn’t seem as spot-on while I was working on it, but I look back and they look exactly like these kids. AVC: How much research do you do to get a time period or a place right? Like in The Death-Ray, there’s a panel in which a character is holding a little photo-cube, which is such a perfect little ’70s décor detail. AVC: At the time The Death-Ray was released in the mid-’00s, it seemed to be in part a reaction to what was going on in the country, in terms of the post-9/11, Iraq War-boosting patriotism. But re-reading it now, that theme doesn’t seem as blatant as it once did. Was that commentary on the Bush era ever expressly intended? DC: Not consciously, no. I was certainly very aware of what was going on, and I spent a lot time listening to the radio as I was working on the book, and reading the news, and living in that world that we were all living in during this crazy buildup to a thing that seemed so wrong-headed and yet so inevitable. I was enraged like everybody else, but I did not think of this work as necessarily reflecting that until, I remember, about three-quarters of the way through, while reading through it for the millionth time, I realized that in some ways this was what the entire book was about. I had been trying to find a shape for these feelings I was having. AVC: When you look at what Andy and his friend actually accomplish when they’re playing “superhero,” they’re not actually protecting anybody—it’s just pure vengeance. It’s all reaction. DC: And it’s all based on these adolescent emotions, which is very much what the Iraq thing felt like at the time. AVC: Andy smokes cigarettes and acquires superpowers. And he has a disintegrator-gun. Superpowers and a gun. Why both? DC: [Laughs.] The original idea for this comic was something I came up with when I was about Andy’s age, about 16 years old. I was obsessed with the Steve Ditko Spider-Man comics, and I was so moved by them that I tried to create… Well, I didn’t think of it at the time as my own version of that, I thought of it as something totally unique, but it really involved the same emotions. It was about a kid who lived with his grandfather, and his grandfather was killed, and the kid was bent on vengeance. The kid had these superpowers, and I didn’t bother to figure out how he got them, but he also had this ray-gun. I think I’ve had the fantasy of a ray-gun that could erase the world from the time I was a very little kid. Actually, there’s a dream in the comic, where Andy dreams that there’s this tree with these little berries that make everyone disappear. I used to have that dream all the time. So it felt like something absolutely essential to my conception of superheroes, and the way I felt about the world when cornered and frustrated. It came out of something really profound in me that I didn’t really understand, so I felt like I needed to go forward with both of those things. AVC: As powerful a fantasy as it is to have a gun that erases objects and people, the way you render it in the book, it’s terrifying. There’s somebody in a panel, and then they’re gone. They’re just gone. DC: There’s nothing more horrifying than that, that there’s no evidence that you were there. I think that’s what we’re all most terrified about: that we’ll just die and disappear and we’ll leave no trace. Even if there’s just a pile of ashes, that’s so much less awful than just nothing. AVC: From Ice Haven on, you’ve been utilizing a style where you change your approach once a page or every few pages. What was the impetus for that? DC: My feeling is that it’s one of the very few things that comics can do that you really can’t do in any other medium. I feel like the reader accepts all of these styles, and after a certain point you can flip the pages and see a character rendered very differently than you saw on an earlier page, and it’s not jarring. It suggests things that you can’t suggest just in the writing or in the plotting. But I also think it’s something that can only be done by a single artist. I think if you had different artists approaching the material in different styles, that’s very different. I think it’s an interesting thing to discover, what’s present in the work even when you’re shifting the styles. I’ve just found it a much stronger way to work. It’s much more liberating as a artist to feel like you can approach each page and each panel with the way that inspires you the most. I think the thing that bogs down a lot of artists is that you’re kind of stuck drawing in a style you’ve developed. I’ve certainly felt that in the past, where I just felt like I had to keep drawing in the same way to maintain this sameness and rhythm throughout an entire book, and it’s not really necessary. AVC: Your New York Times strip Mr. Wonderful was collected this year and offered an upbeat contrast to the book that came before it, Wilson, even though the lead characters in both books are sort of opinionated loners. Those two comics were created around the same time, is that correct? DC: Yeah, but I was done with Mr. Wonderful before I started Wilson. I started Wilson very soon after. AVC: It’s wrong then to read Mr. Wonderful as a happy response to Wilson? DC: Wilson is more of a miserable response to Mr. Wonderful. [Laughs.] I think with Mr. Wonderful, I did that for The New York Times Magazine, and it was taking the idea of an old romance comic and trying to see what that would look like if I were to do it. But once I was finished, I felt like there was a lot more that I wanted to do with that kind of character, by which I mean a character who is that age and that class. So with Wilson, because it wasn’t in a national magazine, I could do what I wanted to do. DC: It’s not stitched. The only difference between the original version and a graphic novel is that it has staples. AVC: Do you miss the days of putting out a magazine once every year or two years, versus putting out a big book? AVC: In theory, The Death-Ray could have been reprinted in perpetuity exactly as it was. DC: Yeah, although really The Death-Ray really should have been a graphic novel to start. I have no idea why I did it as a saddle-stitched comic, other than I just couldn’t bear to stop Eightball somehow. It just seemed like, “How can I end Eightball?” I remember when the Hernandez brothers first ended Love And Rockets, thinking, “How could they do that? It’s the end of an era!” [Laughs.] So it was really more about that, not being able to move on. But it really makes no sense as a magazine, and it’s just so unavailable to so many people. I really want people to read the book, and bookstores never sold an issue of Eightball because nobody knew what it was. To this day I still can’t explain to an average person what the comics were and how the comics originally contained all the stuff in the books. It’s so needlessly confusing. DC: Oh, I haven’t seen the new one. AVC: If you combined what ran in the previous issue with what’s in the current issue, it’s a masterwork, one of the best graphic novels ever published—except that it’s not a graphic novel. It’s in these two different books and broken up by unrelated work from Gilbert. For people who’ve been fans of Love And Rockets for decades, there’s something romantic about that. But there’s also a little bit of, “Jaime’s missed an opportunity here.” The reaction to The Love Bunglers might be different if it had been originally released the way, say, Wilson was. AVC: That first story in the new Optic Nerve was very good, but it did seem fairly “Clowes-ish,” in terms of being structured like a newspaper comic. DC: Oh, I never notice any of that stuff. I’m oblivious to all of it. AVC: What are you working on these days? Are you still actively involved in developing scripts, as well as working on comics? 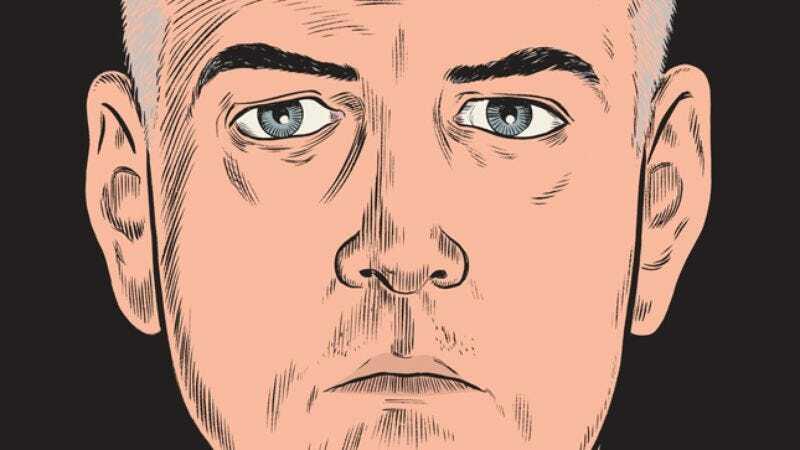 DC: I just finished a script for Alexander Payne for a Wilson movie. We’re working on that. I’m actually working on a longish comic that I don’t really want to talk about, because I might change my mind entirely about it. If it continues to go along as planned, it should be done by the end of next year. AVC: Do you frequently have ideas that you pursue for a while and then end up having to abandon? DC: I do, although rarely do I actually start drawing things. Usually they’re abandoned before I commit too much time and effort. Although I had one right before I started working on Wilson where I spent about a year writing this really complicated, multi-part, graphic novel thing and actually started drawing a bunch of it. I just lost interest in it after a while. It seemed too complicated and too… too “figured out” already. I like to leave a little room to innovate and change things around while I’m working, and this one just left no room for that. It was like, Alfred Hitchcock talked about planning out his movies so meticulously that when he was actually shooting and editing, it was the most boring thing in the world. That’s what it felt like. But drawing comics isn’t like shooting a movie. You can shoot a movie in a few days and be done with it, but drawing a comic takes years and years, and… I just didn’t feel like it, you know? It was hard to get up every morning. That’s the biggest part of doing comics: You have to create stuff that makes you want to get out of bed every morning and get to work.